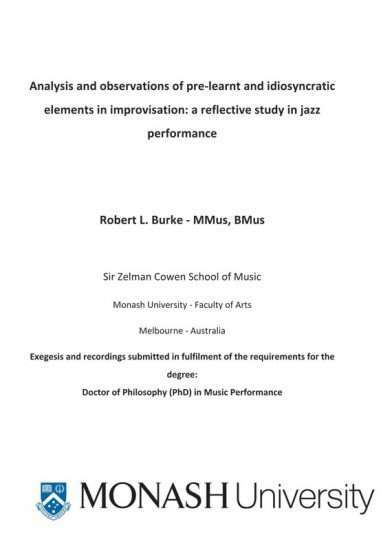 Burke, R & Onsman, A. Experimentation in Improvised Jazz: Chasing Ideas. Routledge. 2018. 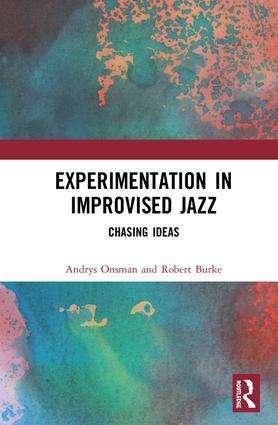 Experimentation in Improvised Jazz: Chasing Ideas challenges the notion that in the twenty-first century, jazz can be restrained by a singular, static definition. The worldwide trend for jazz to be marginalized by the mainstream music industry, as well as conservatoriums and schools of music, runs the risk of stifling the innovative and challenging aspects of its creativity. The authors argue that to remain relevant, jazz needs to be dynamic, proactively experimental, and consciously facilitate new ideas to be made accessible to an audience broader than the innovators themselves. Experimentation in Improvised Jazz explores key elements of experimental jazz music in order to discern ways in which the genre is developing. The increasing interest in artistic research, especially in music, is throwing open doors to exciting ideas about how we generate new musical knowledge and understanding. This book examines the wide array of factors at play in innovative practice and how by treating it as research we can make new ideas more widely accessible. Three key ideas propel the book. First, it argues that artistic research comes from inside the practice and exists in a space that accommodates both objective and subjective observation and analyses because the researcher is the practitioner. It is a space for dialogue between apparently opposing binaries: the composer and the performer, the past and the present, the fixed and the fluid, the intellectual and the intuitive, the abstract and the embodied, the prepared and the spontaneous, the enduring and the transitory, and so on. It is not so much constructed in a logical, sequential manner in the way of the scientific method of doing research but more as a “braided” space, woven from many disparate elements. 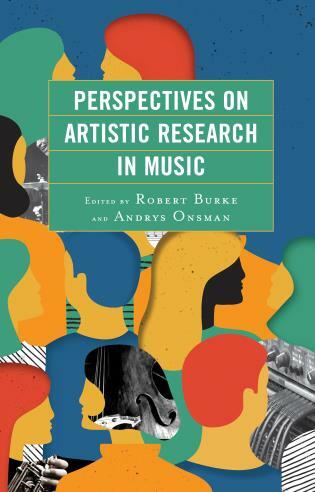 Second, the book articulates the notion that artistic research in music has its own verification procedures that need to be brought into the academy, especially in terms of the moderation of non-traditional research outputs, including the description of the criteria for allocation of research points for the purposes of data collection, as well as real world relevance and industry engagement. Third, by way of numerous examples of original and creative music making, it demonstrates in practical terms how exploration and experimentation functions as legitimate academic research. Many of the case studies deliberately cross boundaries that were previously assumed to be rigid and definite in order to blaze new musical trails, creating new collaborations and synergies. Burke, R.L., Evans, S.J.N., 2012, Pathways to learning and teaching indigenous and world music ensembles, in The Oxford Handbook of Music Education, Volume 1, eds Gary E McPherson and Graham F Welch, Oxford University Press, New York, USA, pp. 890-906.